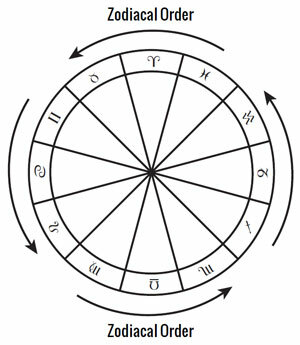 Astrologers use the phrase zodiacal order to refer to the standard counter-clockwise order in which the twelve signs of the zodiac are counted, as well as the usual order in which the planets move through the signs. The concept is derived from the fact that the planets move through the signs of the zodiac in a counter-clockwise order, for example, going from Aries to Taurus to Gemini, and so on, rather than Gemini to Taurus to Aries. The only times when this is not true is when a planet turns retrograde, at which point it begins to move contrary to zodiacal order, which is clockwise. Clock-wise and counter-clockwise are used here relative to how the signs of the zodiac appear in an astrological chart.